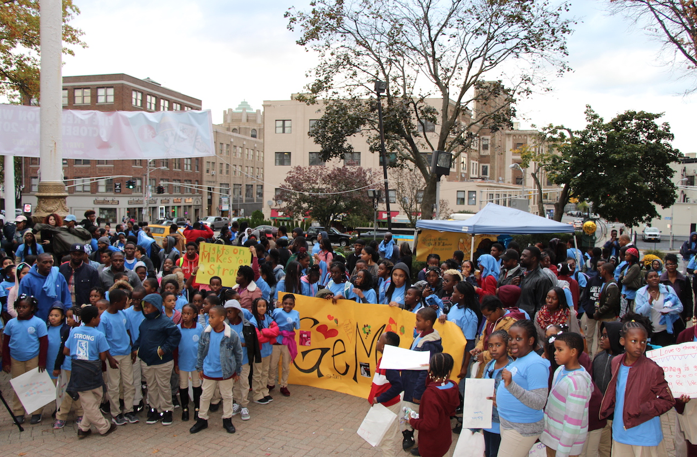 Looking onto City Hall’s plaza on October 26, 2017, a sea of blue and white shirts worn by more than 400 hundred youth were seen cheering and waving banners in support of the City of Mount Vernon Youth Bureau’s Lights on Afterschool Press Conference and Youth Rally. Mayor Richard Thomas, the City of Mount Vernon Youth Bureau Executive Director, Dr. DaMia Harris-Madden, and members of the Mount Vernon Afterschool Program were joined by distinguished guests, parents, and elected officials including NYS Senator Jamaal Bailey, NYS Assemblyman Gary Pretlow, Westchester County Legislator Lyndon Williams, City Council President Roberta Apuzzo, City Councilman Marcus Griffith, School Board Trustee Adrianne Saunders, and School Superintendent Dr. Kenneth Hamilton sending the message that positive youth development programming during unsupervised time is critical to youth success and that the city must keep the lights on and doors open after school. 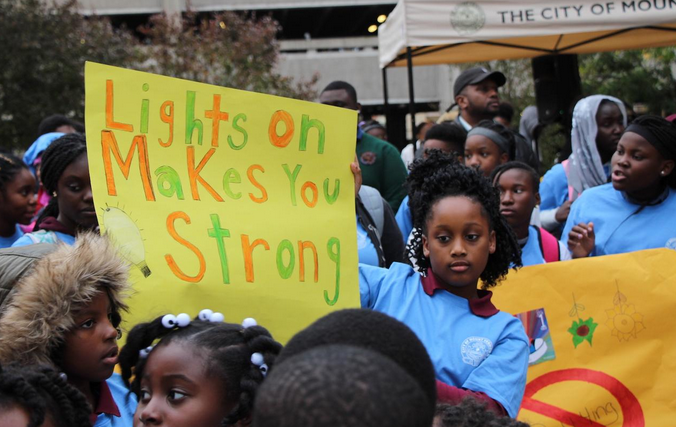 Every year, thousands of Lights on Afterschool events are held across the country to raise awareness of the importance of after school programming. Nationally, more than 15 million children go home and are left without supervision because their parents are working or cannot afford services. However, across New York State, and in the City of Mount Vernon specifically, advocates are fighting to keep youth off the streets and enrolled in safe, productive, and exciting activities. The governor of New York, Andrew Cuomo, has released a proclamation declaring October 26 as “Lights on Afterschool Day.” Advocates across New York State have exhorted elected officials to publicly commit to “keeping the lights on” during the most challenging times of the day- 3pm-6pm. 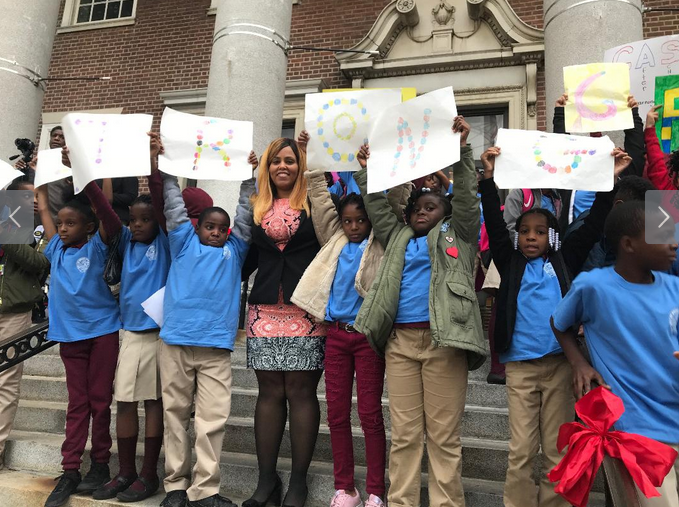 The city’s Youth Bureau has worked diligently throughout the years to increase high quality, affordable, after-school programming for children and youth. This year’s event was co-hosted by Ryan Barnes, a high school student who is an activist through the Youth Bureau’s CAPP Program. Ryan, along with his mother, and members of various after school programs led by the Youth Bureau, testified to the importance of continuing after-school initiatives. The rally also included the participation of non-profit organizations such as the Boys and Girls Club of Mount Vernon, The Sports and Arts Foundation, the Emmanuel Christian Mission, WJCS-Amazing Afternoon, and New Flex Hoops. Face painting for children, along with a health meal was provided during the festivity. 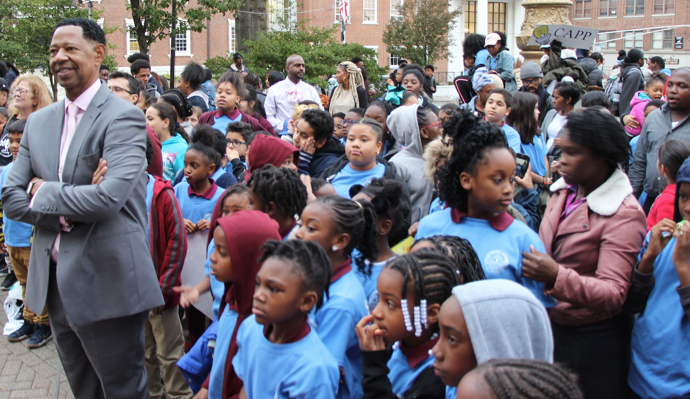 Youth from the Bureau’s Mount Vernon STRONG Program and the CAPP Program, along with the Sports and Arts Foundation’s after school Program were showcased for their music, dancing, and spoken word. One of the highlights of the program was the poem delivered by Dezire Amaker, a participant in the Youth Bureau’s Mount Vernon STRONG Program and a student at Mount Vernon High School, which encouraged youth to stop bullying.